Anne Blabey was born in Richmond, Virginia, but has lived and traveled all over the world, adding to her idea of personal identity along the way. 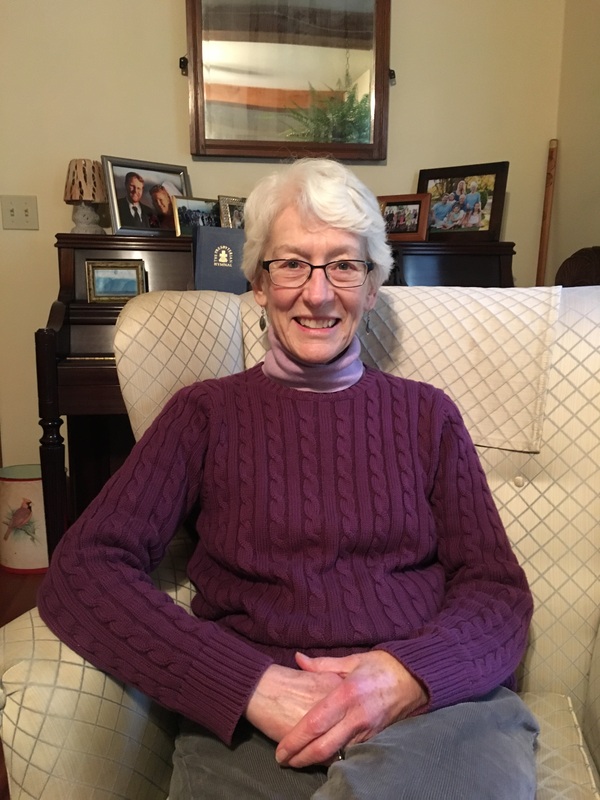 She attended graduate school in Boston, and worked as a teacher for a time in Washington DC, where she met and married her husband, Richard Blabey. After starting a family, the Blabeys travelled around the world in Japan, Malaysia, Côte d’Ivoire, and Chile due to Richard’s job in the Foreign Agricultural Service. In 2006, after their three children were grown and out of the house, Anne and Richard moved to Cooperstown, NY where they are active in the First Presbyterian Church. Mrs. Blabey volunteers her time in various missions related to the church and community including the local food pantry. She is also passionate about environmental issues. Coming of age in the latter half of the 20th century, Blabey saw the rise of social and political movements that are still influential today. From gas shortages and environmental movement, to the feminist and social justice movements, the 1960s and 70s were a tumultuous time in American history. Some of these movements have shaped Blabey’s experiences, whether through waiting in line for gas, or by refusing to work for less money than a male colleague. Her experiences living all over the United States and abroad have shaped her perspectives on home and identity. Blabey’s accounts explore the themes of family, community, church, and the environment. Some of the most interesting parts of the interview deal with the challenges of finding home abroad. I interviewed Mrs. Blabey in her home in Cooperstown, New York a week before the local Glimmerglass Film Days festival, the theme of which centered around the idea of home and the natural world. This, as well as our pre-interview conversations may have influenced the topics of discussion. Mrs. Blabey is a very expressive speaker with a very slight southern accent. I have done my best to preserve the tone of her interview, but researchers are encouraged to consult the audio recordings. This is Jen Vos interviewing Anne Blabey in her home for the Cooperstown Graduate Program Community Stories Project. It is Wednesday, November 8, 2017. Do you want to tell me a little bit about where you’re from? Where I’m from. That’s a very interesting question to start out with because I’ve been thinking about what we were going to talk about and where I’m from has a lot to do with it. I was born in Richmond, Virginia, so I guess you can say that’s where I’m from. Do you want to tell me a little bit about your family? I was born into a family of five. I had an older brother and a younger sister, and my grandmother lived with us for part of the time as well. How was it living with your grandmother? Oh, I loved having her there. She was a wonderful influence, and a wonderful help for my mother and just a wonderful influence on us. I loved being able to get to know her on a day to day basis like that. Very special. Do you have any fond memories of your grandmother? I guess the two things that come to my mind first of all would be how she walked around our block every day no matter what the weather was, she would walk around the block. Up until her nineties she did this. Exercise and fresh air, and just getting out and seeing people were very important to her. The other thing I guess that would come to my mind first is connecting with people was just super important to her. She wrote letters and she got so many letters and cards from people. She made phone calls. She had a large family because she had had eight children herself. So, she just spent, I would say probably nine tenths of her day being in touch with people in one way or another. Wow. And how did you meet Richard? Blind date! It really was a blind date. He was born in Albany, so he’s from this area, this neck of the woods. But he had moved down into the Washington DC area, and I had moved to the Washington DC area as well. Actually even before he moved, he visited his brother who was living there. His brother lived next door to my oldest and dearest friend, and so Richard met her and then when I moved to town she fixed the two of us up, just arranged for a blind date. It did! We had a good time. We had a really good time. But he had also asked her for a list of people that he might be able to call to take out, and so she had given him a list of, maybe ten other women, and so he decided… He did call me first. But then he decided he should go through his whole list too [laughter]. So, he did that first before calling me back again. In the end, it all worked out [laughter]. And what brought you to DC? I had ended up going to graduate school in Boston, teaching blind and visually impaired children and when it came time to get a full-time job after I finished graduate school, I was looking both at Boston and in the Washington area, and this job that came up there I just found very appealing so I ended up moving back down towards the South. So that’s really…It was the job that brought me there. How did you like your job there? I really loved it. I was what was called an “itinerant vision teacher.” I traveled around Prince George’s County, Maryland – which is one of the largest counties in the Washington, DC area outside of Washington. And I visited kids who were in the public schools, in regular classrooms, and I would take them out and work with them on braille or abacus, or other skills that they would need. But they basically were in the regular classroom most of the time, and I loved the idea that they were being incorporated in the regular classroom most of the time, and I loved being able to work closely one-on-one with them as well. And I had great kids. So, I enjoyed that very much. Did you have any difficulties with that job? Was it hard sometimes? It was hard because it did involve so much driving, and Prince George’s County is such a large county. So, dealing with the traffic, and also, actually at that time we had a really severe gas shortage, and so I had to spend quite a lot of time standing in line, waiting in line at gas stations for gas during one part of the time that I was working there. So, I would say those were, just the amount of time it would take to drive around, and having to be concerned about gas and the high likelihood of having a flat tire – which I did a couple of times [laughter]. So those were I’d say the hardships. Again, the kids I worked with, the teachers – I loved working with such a variety of people, because I worked not only with the kids and their teachers, but also with the guidance counselors and the P.E. teachers and the principals and parents, and the other vision teachers in our program were also just really good friends so it was mostly a very good situation. So, with the gas shortage, would that have been about the 70s? How did you feel about the climate back then? Gosh, now that’s a really good question. I don’t think it was really on my radar screen at that point. I don’t think we were really thinking that much about what was causing some of the problems. We were starting to be concerned about pollution, and we were starting to be concerned about your own personal pollution – smoking, smoking issues, second hand smoke, and that sort of thing, but in terms of climate change I don’t think we were really thinking about that yet. [CGP Professor] Will [Walker] told me you might have some interesting thoughts about the environment. Can you tell me a little bit about your thoughts and how those might have been influenced by events in your life? Yes. The reason Will mentioned that is that he probably is aware that I’m on the environmental stewardship team (committee) of our church [First Presbyterian Church in Cooperstown], and it really is an issue that I feel very strongly about, and it’s an issue that I do think we should approach from a faith standpoint as well as from pretty much any other standpoint. I think it’s something everybody should be aware of, but I do think that as Christians we really need to be good stewards of this environment and that means being very sensitive to how we’re using everything, but especially our natural resources, and what are we wasting? What can we do about it? I also feel very strongly… I’m known as the “recycling tsar” in the [Cooperstown] Food Pantry and at the church. It amazes me how many people still aren’t really aware of all the opportunities that we do have to recycle, and how critical it can be. We’ve seen a couple of films that are just so impressive, I don’t know if you’ve seen Plastic Paradise. Plastic Paradise is one that just talks about how much plastic is just left in the environment—it will be there forever because it doesn’t break down. And then Leonardo DiCaprio did a film called Before the Flood which is also just a very good overview of how we got to be where we are today in terms of our environment and the climate, and things that we can do about it. So yes, I am very much concerned about that and glad that that is something about me that he really remembers. So, your views on the environment seem to be very shaped by your faith, which is interesting considering how many people sort of feel the opposite. How do you wrestle with people of faith who don’t believe that we should be stewards of the environment? Yeah… I find it really hard to believe [laughter]. And I think it’s not that they don’t feel that we need to be stewards of the environment, I think it’s just that there are people who have not been convinced yet that people are to blame for where we are today, and that this is not a situation that is going to change unless we people do something about our behaviors and activities. I do know that there are people who have had a hard time being convinced that climate change is something that we can affect, who are changing their minds. So, I think it is something that is starting to change, and I’m glad about that. You’ve mentioned before that you’ve lived abroad in several places. Can you tell me a little more about that? Yes, I guess I’ll go back to what I said in the very beginning when you asked me where I was from. I started thinking about… I didn’t know exactly where this conversation was going to go, what we were going to cover. I had mentioned about living in various places, and was thinking about the fact that usually one of the first questions that people ask of anyone is “where are you from?” And that started me thinking about how do I identify myself? And I’m realizing as I’ve gotten older that less and less the pertinent question is “where are you from”—which is what it always used to be for me—and it’s what I always thought was the most important thing about me: where was I from. But the question now is more “Who are you?” And “With what groups or activities or faiths or organizations do you identify yourself with?” So that’s sort of what I’ve been thinking about just in the last few days. So, I told you that I had come from Richmond. I went to college in Massachusetts, I went to Smith College. And so, I was the southerner going up to the North [laughter]. So, people up there were always talking about my southern accent. And believe it or not, I took a Confederate flag up with me to put on my wall in my freshman room. And that was something that… I think back now and I think “what did my roommate think when she saw that?” [laughter] That was to me at that time, it was just a representation of where I was from. And I was a southerner. And there were a lot of things about the South that I loved, and loved to be identified with: southern hospitality, southern food. Just a relaxed, harmonious way of life, those were the sorts of things that I identified with. As time has gone by, I’ve gotten more and more horrified at the thought that that (the flag) was what I took to represent where I was from when I went off to college. So, after I graduated from Smith, I moved down to Atlanta. And of course, down there I was seen as a northerner. My accent was always called a “northern accent,” and I thought “this is really bizarre!” [laughter] Just sort of going back and forth here, a person without a home. I did not really particularly enjoy living in Atlanta, and it made me realize that there was a lot about southern heritage—what I considered then to be southern way of life—that I really didn’t like. So, I ended up staying in Atlanta less than a year and I moved up to Boston. But parenthetically, I just have to bring this in: I worked for the American Cancer Society when I was in Atlanta, and one of the reasons—another reason I decided to leave, was that at the American Cancer Society, the particular branch where I was working, practically everybody in the organization smoked. They smoked in board meetings, they just didn’t smoke around volunteers. And I just thought the hypocrisy of it all was just unbelievable. It just really bothered me. Secondly, I found out that a young man, same age as I was, was being paid about twice as much as I was. And I asked about it, and they said, “Well he has a wife and child.” And I just said, “That’s unacceptable. That’s not fair.” So that goes way back. So, I ended up moving back to Boston and then as you know I ended up moving down to Washington. I worked at the Harvard library for four years and then I went to graduate school, then I moved in to Washington. Washington, I felt like that was a good fit. It was southern enough and it was northern enough [laughter]. And I still kind of saw things in the light of whether “they” or “I” or “southern” or “northern,” it was a very interesting way of looking at life I guess at that point. But then my husband was working for the Department of Agriculture, and he was in what’s called the Foreign Agricultural Service. So, we ended up going overseas not too long after. Well, we had our first child first, and then we started going overseas. So, it was at the time of the birth of our first child and our going overseas that I stopped my work with the vision program. So overseas, our first post was in Japan and we were there for three years. So again, when you’re overseas the questions come up: “Where are you from?” [laughter] And also, you’re very much identified actually as being American, and so you’re very much aware of that wherever you go in a foreign country when you’re associated with the embassy. So, one of the first things that we did, or one of the first weeks that we were there, was to go to church. And we just decided to go to this church that was the closest to where we lived in Tokyo, and it was an Episcopal church. I had grown up as an Episcopalian. So, we found that there was this Episcopal church that was not far from us and we decided to go there even though we were both Presbyterians at that point. Even though we understood not a word of the service, it was still an experience that made us feel at home because just the rhythm of the service, we could figure out what was going on and the hymns we could follow along in the hymns. It was a very eye-opening experience to realize how much that being at that church service meant to us in those first weeks that we were there. So, fast forward [laughter]. We were in Tokyo for three years and then we went to Malaysia for two years just immediately afterwards. And I guess, what would I say, just trying to stick with the theme of identity. Hmm. That was a very tough post for us, especially in the beginning because we ended up having a lot of things stolen from us. We had – this gets very complicated – we had gone on a home-leave, and we were actually away for about five or six weeks three weeks into our time there, so we had not yet received our shipment of things from Tokyo, and we had sent some things from Tokyo air freight to the States – of course we had a crib and that sort of thing, some clothes. So, we had things that came in the house that we lived in in Malaysia, we had things that were in storage, we had things that had been shipped to Malaysia that hadn’t gotten there, we had things that had been shipped to the States. And we just…we were scattered [laughter] all over, and when we came back from our home leave, it was very discombobulating to try to figure out when we thought we couldn’t find something. We thought “Oh well, maybe we sent that to the States, maybe it got lost there.” And it was odd things: some baby clothes, jackets, some jewelry. It was just odds and ends of things. And it took us probably a month or so to figure out: “Yes, these things are really missing!” And then it turned out that our…This is really getting too complicated. Suffice it to say it was a very disruptive and unpleasant experience that we went through that involved a maid who was working for us who ended up, she was actually the one who had stolen the things from us and she had passed them on to, we had guards there because the security situation was a little uncertain so everybody in the embassy had guards. So, she and our guard had been [laughter] working together… so, that was not a very positive experience overseas. Most of our overseas experiences were very positive. That was just not one of them. So, after we were in Malaysia for a couple of years, we came back to the States and we were in the States for four years. And it was interesting, one of the reasons that we wanted to come back to the States and stay for a significant period of time was that we wanted our children to know what it was like to be raised in the States. To get to know their family and to make friends and get a good start on school in the States. We wanted them to be able to identify as Americans. So, we were glad to have that opportunity to be back in the States for four years. Then, we ended up going to West Africa for four years. And that was just a wonderful experience. We had a really fantastic international group of friends connected through the school; our children went to an international school there. And the entire experience there, I think all of us would look back on as being positive despite the fact that there were some scary times there. There were some protests that became quite violent which took place not too far from where we lived, and we were just very thankful for the support systems that we had both at the embassy and just within our families and the international community there. We just felt like we were not facing anything alone and the whole thing ended up being a very positive experience for us. In many ways, we were sorry to leave although the situation had gotten so bad by the time we left that we realized we had to leave. So, we left there and came back to the States again, and our son ended up graduating from high school when we were back at that point and our middle child graduated from 11th grade and our youngest graduated from 8th grade and we ended up going to Chile at that point. We had to leave our son back in the States in college, and our middle daughter, we had asked her if she wanted to come with us or if she wanted to stay back in the States with family. She said she really wanted to come with us because she wanted to take advantage of having one more year of having the overseas life. So, we moved to Chile. The move itself was very difficult because on the day that we flew down there, we found out that my sister had cancer. And she had two young children and elderly parents, so it was very hard to leave, but we were literally at the airport when my brother-in-law told me that they just learned that she had cancer. It was very hard, and we got down there and it was very hard down there too because we moved from summertime in August here, down to wintertime down there. It was wet, and cold, rainy, the weather was miserable. And the beginning school experience for our two daughters down there was horrible. The teachers and the administrators at the school—we have never had unpleasant experiences with international or any schools. I mean, school had always been such a positive in our lives, but that was very, very difficult situation for our girls. And oh, the embassy situation was bad. We did not like the ambassador, nobody liked the ambassador. Morale around the embassy was really poor [laughter]. We thought, “What are we doing? Why are we here?” [laughter] And three weeks after we moved down there, I came back to D.C. to stay with my sister’s family until she died after three weeks more. So, rocky beginning there, and again I think it made us wonder why were we doing this, and it made us question our connections with our family: were we doing a real disservice to our family—both the family left in the States and the children with us—to be doing this overseas bit, and just a real questioning time. And this was the first place where we’d been, where we did not feel close to a church family. We had had wonderful interdenominational, international church groups—we ended up having one in Japan, not the Japanese Episcopal church we started with, but Japan, Malaysia, and Côte d’Ivoire. We had wonderful church families there. And in Santiago, there was an international church that was an English-speaking group. It was a very fundamentalist group there, and the service itself was very different from anything that we had ever experienced. Even though the people were very nice and welcoming, warm, it just did not feel like the right place for us. So, it took us a while to find a church home there. [Pause] Let’s see, I’m trying to think now, what sort of thread... do you have any questions at this point? [laughter] I’m just sort of talking myself into a hole here. Being in Chile going through all of those rough experiences must have been difficult, especially not feeling connected to a church. How did you cope with those circumstances? Well, I would say that a number of things happened that made it easier to cope. One is that the first summer that we were there, our middle child (our older daughter) and my husband, came back to the States. He had a conference, so he was able to get her set up with going to college. It left our youngest and me there in Santiago alone, and I think that being there together, we took a long trip ourselves, and we had a wonderful time and our Spanish started getting better because of this travel that we did. And I think that getting to know more of the country, getting to feel independent just the two of us without the other two, and developing our Spanish. I think that those three things really, really helped. The second thing that helped was that when the second year started, the whole embassy became involved in planning for a big international conference that was taking place there. And President [Bill Clinton] and Mrs. [Hillary Rodham] Clinton were going to be coming down, and it was an “all hands on deck” sort of thing. So, there were a lot of volunteers that were asked to help in the embassy. So, my daughter and I got involved in that even before my husband got back and that experience allowed us to get to know more people within the embassy. Both the Chileans and other Americans in the embassy whom we hadn’t gotten to know yet. And it pulled the Chileans and the Americans in the embassy together. It was really a fun experience working on this. And then it was very exciting when it all took place [laughter]. We all got to do some pretty exciting things, you know, dinner at the Moneda—the Presidential Palace and oh, just all kinds of really fun things that were pretty exciting. So, I think probably the two main things were the coming together of people in the embassy and also the realization that that ambassador was going to be leaving and another was going to be coming [laughter] and learning Spanish. My younger daughter and I knew how to count and say the days of the week before we got to Santiago in the beginning. And that was one of the things that made it really hard I think. So, as we started learning Spanish, that made a huge difference. And we found a church there too that we started to go to, that we started to become involved in and really liked, so that also made a huge difference. And then we started doing more traveling around in the country and by the time we left, we absolutely loved Chile! [laughter] And I would love to go back there, see people and see things again down there. But boy, that was a rough beginning. So, what brought you to Cooperstown? Ok, so, as I said, my husband is from New York. He’s from Albany, and he had an uncle who had been very much involved with NYSHA [the New York Historical Association]. And he would come here to Cooperstown for meetings every summer and he and his wife talked a lot about Cooperstown when Richard was growing up. So, he had heard about Cooperstown for many years. When our children were small, we actually came over to Cooperstown at one point. We have a cottage that Richard’s grandfather had built. It’s just outside of Albany, so we used to come up in the summertime and stay at that cottage. So, we came over here from there for a picnic, and just a day of, you know, going through The Farmers’ Museum, that sort of thing. It was somewhat in the background for us. Our home in Washington was—we knew that it was getting to a point where we would need to move out of that house. It just did not lend itself to that stage of our family. Our son by this time was married, and the configuration of bedrooms and bathrooms and so forth—we knew that we would need to find a different place to live. And the traffic and the heat in the Washington area were so bad that we just decided, “you know, the time has come to move away from Washington.” My father was still living in Richmond, and my brother’s family was still living in the southern part of Virginia, my sister’s family was in a different area, so that was not really a consideration, but it was hard to think of leaving my father in Richmond. So, we first started looking close out from Washington. And everywhere we went there were just outlet malls and civilization was just sprawling. So, we just gradually kept moving further and further away in terms of where we were looking. And we looked at places in Pennsylvania and Maryland and we looked along the Hudson, and finally my sister-in-law said, “Have you looked at Cooperstown, and thought about Cooperstown as a place to live?” And we said, “No, but we’re going to go check out the Finger Lakes, so we’ll stop by Cooperstown on the way.” So, we stopped by Cooperstown and went to look at the Finger Lakes, and decided that that wasn’t really the area. It was just too far away from the beaten track for people that we wanted to be able to visit with. So, we stopped by Cooperstown again on the way back and thought, “Now, really, this would be it! This was nice!” We liked it. And we saw the Presbyterian church, and saw that it was the oldest church in the village and it turns out that two of the people we met when we were sort of roaming around the grounds, had gone to Hamilton College which is where my husband had gone. So, we just started thinking more about it and started looking at some houses, and eventually just decided “ok, let’s do it!” so that’s how we ended up moving here. 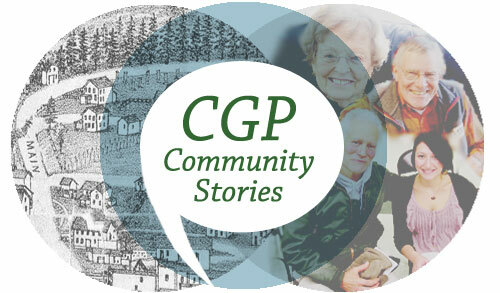 How have you found the community and, you know, the church? Ok, so that sort of brings me to the question that we were talking about at the beginning of identity. We had belonged to a Presbyterian church in Washington, which was a big part of our lives down there. We had been very much involved in it and really appreciated the role that it played in the community and also the role that it played in our children’s lives as they were growing up. And so, one of the things that had appealed to us about Cooperstown was this little Presbyterian church here. So, we moved up Thanksgiving eleven years ago, and so that first Sunday we walked to church, we thought “Oh, this is fantastic, we can walk to everything here!” We walked to the church, and this church here just seemed like a mini version of our church in Washington DC. We just immediately loved it. So, we didn’t even bother to go around to the other churches, which we had thought we would do. We just decided to go ahead and join that church and it was a very welcoming community. Very, very nice people and we really just felt immediately like we belonged, and that it was a community that we wanted to be identified with. We liked the fact that it seemed to be just as much involved with mission—both within the community and outside—as our church in Washington had been. One of the things that we felt a little guilty about moving away from Washington for was there was so much need on the streets of Washington. We thought, you know, “we’re moving away and taking away two more sets of hands, and brains, and feet, and so forth to help out with things here and are we just giving up and giving in and just thinking only of ourselves?” And then when we came up here, I had expressed that thought to one of the people that I met the first day we were looking at the church, and this gentleman said, “well you don’t need to feel like you’re moving away from the needs because there are plenty of needs here, and in fact, we are part of Appalachia here. You may not realize that, but we do serve people who are in Appalachia.” And he told me about the food pantry and so that ended up being something that I got involved with almost right away. So, through the church, through the people I met at the food bank (it was the food bank then, it’s now the food pantry), and through the Democratic party—different organizations than in the past, usually we met a lot of people through our children’s schools, but of course, we were in a different time of life now, so we’re not as much associated with schools. But we still love to go to the school here and see the plays and that sort of thing. And every time we’ve been to the school it’s been very welcoming as well. So, I would say it’s been great—and we’ve been so pleasantly surprised at how much there is to offer here for such a small community. The museums, and the concerts and the library and the talks—Glimmerglass University hasn’t been going on for a few years, but that was really a fun thing. We have been carrying books around with us—all around the world—and brought a bunch up here and thought, “ahhh, we’ll just settle down and read now! [laughter] For years!” and I have hardly had any time to read it is just, life is just very full here. And that’s a good thing. And our children love to come visit us here. Can you tell me a little about your mission work through the church? The food pantry, and that kind of thing? Well, the food pantry has certainly been the major one that I’ve been involved with. I’ve been a volunteer there once a week for a number of years now, and I’m also on the board, so it’s something that I feel really strongly about and we’ve just now hired our first paid executive director, so I’ve seen huge growth both in the use of the food pantry and in the development of the organization of it. So that’s been very exciting. I’ve also been on the deacons at church, and that’s been more of a mission serving our own community, our church community. The people in need of some sort of—pastoral care, not that I’m a pastor, but deacons help with pastoral care. So, that’s something that I’ve enjoyed. And I am now on the session the church, I’m an elder of the church, that’s the governing board of the church, so that’s been another way I’m getting to know a different part of the church organization. We do, but I have not been very much involved in it other than helping them sometimes with their mission dinners, but the Living Waters for the World helps to provide clean water systems to communities in Honduras. So, our church sends a team down there, has been sending a team for three or four years now, and will be sending another one in January. And our church allows a lot of different groups to meet on its premises: AA [Alcoholics Anonymous] programs, Cooperstown Concert Series, some support groups for Parkinson’s, that kind of thing. So, with all the different places you’ve lived and talking about the thread of identity, can you talk a little bit about what it means to find home in a place? So, what does it mean to find home? Ask me after the [Glimmerglass] film festival! [laughter] I think finding home means finding a place where you feel that you can use your gifts to the best of your ability, and where you feel comfortable, where you feel inspiration from other people, or from other groups or organizations. I think it’s where you feel that you are comfortable saying that this is where you are now in your life and you can look back on other places and other experiences and look at the good, the bad and the ugly [laughter] and feel thankful that this is where you are right now. Can you tell me a little bit about what it was like to raise children in different countries? I think in a way, it was easier for us to raise children overseas than it was for some people, in our generation raising children here because the pressures of conforming—the pressures of things like watching too much television were not things that we had to contend with in some places where we lived. There was little to no television at all! Malaysia for example, there might have been one children’s cartoon, I don’t know any adult entertainment that we watched on television at all, I think. So, television played much less of a role in our children’s growing up than in that of their counterparts. The fact that they had built–in support systems wherever we went, in terms of the embassy community, the international school community, those were just wonderful for them. Having the opportunity to get to know so many people from different places in the way they really lived, not just as they’re portrayed or… they got to know their real cultural backgrounds rather than just superficial knowing. I think the schools that they went to were excellent, and being able to learn foreign languages—our son and older daughter speak both French and well, our son, he can speak French really, really, really well. And our middle daughter can speak both French and Spanish, and our youngest who didn’t really have much opportunity to learn a whole lot of French, she knew it and understood it when we were there, but there wasn’t as much of a carry over for her in French, but she’s fluent in Spanish. So, I think those are real advantages. We were fortunate enough in that our children really did enjoy being overseas. We certainly met our share of families whose children did not. They didn’t like being uprooted from their friends and family and other things that they enjoyed at home, but ours, fortunately really, really enjoyed it. There was one thing we found that was hard that we hadn’t anticipated when we moved the first time when we went to Japan. Our son was three months old, and I think we had not anticipated how hard it would be though to have a small child and not be able to share our family with our family at home. Because we were there three years without being able to go home at all. That was really, really hard. So, I will say that there are definitely some downsides. And is your family pretty far flung now? [laughter] Yes, our youngest daughter is in Texas. Our middle daughter is in Alaska, and our son is in California, so they’re far flung. [laughter] but they’re not overseas so I guess I should feel happy about that. That they’re not as far away as we were from our parents. Well, I think that’s been about an hour. So, thank you so much for taking the time to speak with me. You’re welcome. Thank you. I hope it turns out ok.
[laughter] I’m sure it will be fine. 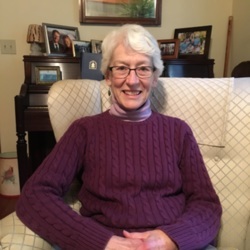 Jen Vos, “Anne Blabey, November 8, 2017,” CGP Community Stories, accessed April 25, 2019, http://cgpcommunitystories.org/items/show/329.